Nominations for the October 22 municipal election in New Tecumseth have now closed. In all, 31 candidates, including 10 women, are running in eight wards, or for the position of Mayor or Deputy Mayor – with the future Mayor and Deputy Mayor also representing the municipality at the County level. The Times of New Tecumseth and Adjala–Tosorontio invited all 31 candidates, including those running for the role of school board trustee, to participate in our ‘Meet the Candidates’ series. Over the weeks to come, we will publish their answers, to the questions we’ve posed, verbatim. Allowing you, the voter, to opportunity to make a more informed choice as you cast your ballot on Election Day 2018. In this article, we will focus on the two candidates for mayor – incumbent Rick Milne, and journalist Tony Veltri. Between now and November, when the new council is sworn in, the current New Tecumseth Council has been declared a “lame duck”. Under section 275 of the Municipal Act, restrictions are placed on outgoing councils after nominations have closed, if less than 75 per cent of the current Council has chosen not to run, to prevent them from making unpopular decisions before they exit. Primary reason you’re running? To serve the people of this community. The knowledge and experience I have gained by being in municipal government since 1984, can be an asset in moving our community forward. What are our most important challenges facing the community? The Internal Transit System, Tottenham Water, The New Town Centre, managing growth and infrastructure up to including 2031. What do you cherish most about this community? Definitely the people. I had the opportunity to meet some very talented young people with “The Mayor for A Month” program. We should be very proud of the generation coming behind us. What type of leader you will be? Having an open-door policy, listening to the people and providing them with the opportunity to express their concerns. Working with council and staff on issues that will improve the community quality of life. Encourage the councillors to become more visible in our community and listen to those that elected them into office. Be respectful of those who may disagree with certain goals and objectives. Everyone has a voice. What are your priorities for change in our municipality, in the short term? The short term would be the water for Tottenham and an internal transit system. Tottenham has been waiting for a long time for this to happen. For the Long Term? Our seniors will make up the majority of our population in a few years. We will need affordable housing, adequate home care and critical care facilities, plus qualified people to operate these facilities. At present we are working closely with Simcoe County in expanding the Simcoe Manor facility. An indoor pool would also be a long-term priority along with the Sports Facility in Beeton. What are the biggest fiscal challenges in our municipality, and what do you envision as the best way(s) to address them? The biggest fiscal challenges in our municipality are the New Town Centre, the New Fire Station and always our roads. These are the result of population growth. As in other communities these projects are partly funded through the provincial and federal government plus debentures extended out over a period of time. Another challenge is meeting the needs of the community without burdening them with higher taxes. This is a challenge that all municipalities face today. We must learn new ways i.e. working with 3rd parties, increasing business development, and industrial growth. What innovative projects would enhance life in this area? A community pool would certainly enhance the quality of life. An internal Transit system would also be beneficial. This would encourage more people to get out and enjoy events in our community. What is your perspective on the best way to collaborate with other levels of government to ensure a sustainable and prosperous future for our area? The most important thing is keeping the door of communication open and constantly working with the other levels of government. We must ensure that our representatives are aware of the issues facing our town. They need to visit our town more often, know what our major issues are and help us become more aware of funds available to meet our concerns. How do you envision communicating with constituents? In today’s society, there are many ways of communicating i.e. phone, face to face, social media, television, radio, newspaper etc. Communication is not the issue. The issue is you must be sure that communication is done in a professional, accurate and clear manner. Communication is very often mis-understood but has become a very important part of our democracy. That is why we must get it right. What will you do to continue to be involved with the community should you not win? No matter the results, I will always be involved with organizations in our community. They represent an important part of who we are in the town. My heart has always been for the betterment of this community and its why I care. Primary reason you’re running: I believe I bring a unique skill set to the Mayor’s office developed over 28 years as a Public representative watching, listening, investigating, reporting on every council term since 1990. That extends to Simcoe County council, the Simcoe County public and separate school boards, health, provincial, federal politics, and crime. But New Tecumseth politics has been my life. I’ve seen it all, I’ve written it all. Each of the councils had their own styles, good and bad. And through those years I heard continuously, “if you can do it better, why don’t you run?” Well, I believe I can do it better, and that’s why I’m running. I’m running for the opportunity to change the direction of council as it seemed focused this term on killing any incentives for volunteers and community groups by attacking their lifeline grants and fee programs, hiking user fees adding hundreds and in some cases thousands of dollars to the cost of running local events and programs; its annual battles with the BIAs in Alliston, Beeton, and Tottenham; its sell off of public assets; its attack on home based businesses; its near 30 “special meetings” and its near 30 in camera meetings since March 2017; Council’s willingness to open the door to Simcoe County taking over our water, wastewater, and planning process; its disregard for consideration of electoral reforms, an amateurish ward boundary review; elimination of virtually all committees; its eagerness to saddle residents with an $8-$10 million debt for an over-developed administration centre plus depleting reserves by about $7 million. And through it all a lack of leadership that permitted it to happen. I’m running to offer positive, proactive change, where groups like the Beeton Fall Fair, or the Christmas Hamper program in Tottenham don’t have to stand in front of councillors because they missed an arbitrary deadline, or to explain why the new fees are hurting local efforts. I’m running because I see meaningful public input and transparency slipping away each year. I’m running because I care New Tecumseth does not lose control of its own destiny within a Simcoe County system that craves more authority at our expense. I’m running because I worry the status quo will welcome mega development to our community. I’m running because we can do better. Campaign slogan: A Change is Coming. What are our most important challenges facing the community? : We need a new hospital. Our MPP Jim Wilson, and the hospital administration, can expect my full cooperation and support to make it happen. Developers who expect to build residential subdivisions in New Tecumseth should be required to contribute to hospital redevelopment. I am ready to be the mayor who insists on it. We need a new Banting Memorial High School building. We’ve missed out on the past three funding cycles, in large part because the School Board has been unable to secure any kind of partnership commitment from the current council and its leadership. The Board’s representatives made several deputations to council during that period, leaving each time without any clear direction from council. It’s time for proactive leadership to work with both our school boards to maximize all partnership opportunities which in the end enhance the lives of our children and communities. It will be an immediate priority to work with the school board to make a new Banting Memorial High School a reality. It’s long overdue. We have many developers and land speculators who have purchased thousands of acres of our farmland and rural properties ringing our settled urban areas in Alliston, Beeton, and Tottenham applying tremendous pressure on our town, and at the County level, for approvals to permit thousands of new homes. Unfortunately, the mayor’s office today is all too welcoming for the developers. Who is protecting our interests as residents? We have developers who own commercial and industrial zoned properties lobbying to allow residential development instead. I am absolutely opposed to trading employment/commercial land for residential subdivisions. New Tecumseth needs economic diversity, and gainful job opportunities, along with real affordable housing. The mayor and deputy mayor, both county councillors, have voted in favour of Simcoe County intrusion that potentially could cost us control over our water and wastewater infrastructure, and our ability to control our own planning in New Tecumseth. They have allowed these intrusions without considering the long term ramifications for New Tecumseth . If we relinquish control of our water, wastewater and planning to Simcoe County, there really is nothing left for us as a municipality except where to set up the park swing sets and stop signs. Connecting Tottenham to our water pipeline, completing the linkage between our three urban areas, needs the same sense of urgency this term of council felt was required to ignore the concerns of Briar Hill residents and rush through connection of municipal water to the privately serviced community. Nearly all decision-making was done behind closed doors, despite the threat of litigation. Whether you are looking to rent, buy your first house or move up, the lack of affordable housing remains a major issue in New Tecumseth. Council has had ample opportunities to insist developers set aside those units as a condition of approval, yet little has been done. Over-inflated commercial lease rates in the local business districts also make it difficult to start and nurture local business opportunities. A commercial landlord/property owner summit as it were, is long overdue. What do you cherish most about this community? I believe all the clichés still apply because our residents, our volunteers, and community service clubs, and non profit organizations, and event organizers, and merchant groups, ensured we maintained a small town atmosphere; a safe, and vibrant community spirit still permeates through each of our communities. And, while transportation can be a challenge for many people, we still otherwise are not isolated from the best city life has to offer and the four season outdoor amenities, within easy commutes. What type of leader you will be? Proactive. Open-minded. Transparent. Unwavering, when it comes to protecting our interests as a municipality. Well thought-out before making decisions, ensuring councillors are as well. I believe in absolute public participation and an open door policy. What are your priorities for change in our municipality, in the short term. What about in the long term? The immediate changes would include moving back to weekly Wednesday council meeting dates (preferred). Mondays are inefficient for the Business of the Town because they are interrupted by holidays. Additionally agendas are posted Fridays for Monday meetings, leaving little time for public scrutiny. We need more meetings to carry out the Town’s business so the need for “special meetings” (where public input and scrutiny is limited) is eliminated. I’m also committed early in the new term to introduce recorded votes via touch screen pads on every matter. The technology is easily available, and there is no greater way to hold council accountable than to know how they voted. No more half-raised hands, or looking around the table first to see how someone else is voting. I would like to reintroduce committees of council, particularly in planning, but certainly open to others which include members of the public, who are not simply an “advisory” group. These committees of council would meet on their own scheduled nights, deal with active files, then make recommendations to council. And, I would like to refashion the “consent agenda” whereby all issues that involve a (to be determined monetary value for example) can not simply be pushed through in one blanket motion without it being pulled for discussion and separate vote. Too many important matters with deep ramifications have been approved without proper vetting. Council needs to be accountable on all matters. What are the biggest fiscal challenges in our municipality, and what do you envision as the best way(s) to address them? The most significant fiscal challenge we face as a community is the decision to proceed with an estimated $15 million redevelopment of the former Alliston Union Public School site into a new administration centre. This project is proposed to drain approximately $7 million from reserves (accounts the Town has been warned repeatedly are dangerously low to begin with) to help finance; $7 million in reserves we will never be able to replenish. Most of the take is from the HEC (Hydro Electric Commission) sale reserve fund, which the 2018 budget showed was below $2 million as a result of this decision. And, if that’s not troubling enough, the remaining $8 million, which is probably on the low side, is to be debentured as long term debt. Straight taxation. This is not a development charges eligible project. Moving forward on this project as currently constituted is a fiscal recipe for disaster. Particularly at a time when the housing market is starting to soften, interest rates increasing, and uncertain economic factors beyond our control, in play. The AUPS property was a good real estate investment, purchased for about $1.1 million, and paid for by the sale of public assets (another problem). The problem with the administration centre pending boondoggle is no other options were considered as part of this process. For example, currently, the now former Tottenham Medical Clinic building is for lease/sale. It presents an opportunity to investigate whether an ideal arrangement can be made to purchase the site, and relocate some Town departments there, easing congestion in Alliston. It would provide easier access to a Municipal office and services to residents in the south end of the Municipality. It wouldn’t cost $15 million. We could sell the AUPS site and use those proceeds to invest in developing a Tottenham location and to bring the Alliston administration centre up to a better standard. Neither of those combined will cost $15 million. There are better options that won’t drain our reserves, or saddle us with debt we can’t afford. What innovative projects would enhance life in this area? I’ve always been a vocal supporter of trying to attract a post secondary campus to New Tecumseth. Innovation and education go nicely together. The School Board’s proposal as part of its new Banting replacement, includes a partnership with Georgian College, and the YMCA. But, again, for some reason, this term of councillors have lacked any vision on that front. And, frankly, in our community, public transit would serve as innovation, which is a sad indictment as we’ve left hundreds of thousands of dollars in gas tax transit revenues on the table, because we’ve stayed stubborn, subsidizing a taxi service program that does disserve to the term “public transit.” Economic development also drives innovation, but that takes a proactive local government. What is your perspective on the best way to collaborate with other levels of government to ensure a sustainable and prosperous future for our area? This next term of council coincides with the change in government at Queen’s Park; a government that includes our own MPP, Jim Wilson, holding a senior cabinet portfolio in Trade and Economic Development. We have one of the world’s great automakers in New Tecumseth, Honda of Canada Manufacturing, and its various direct and indirect suppliers that are major economic drivers not only in New Tecumseth, but the entire region. And this at a time when the United States is proposing to up-end trade agreements, and threats of imposing crippling tariffs on automobile imports that would hit us directly. The mayor and council, have been woefully silent on the matter. Certainly, we can’t expect to influence the U.S. President, but that doesn’t mean we should be sitting on our hands. We’re a Town on the front lines of the potential tariff war, and we should be taking an active role, supporting both provincial and federal government positions, assuring Honda and our farmers and other businesses who trade in the U.S. that we have their backs, that we will offer whatever support we can. We should also be proactive on the economic development front. Diversification is a well-proven buffer. Growing and supporting not fighting with our local businesses is important. But that takes proactive local government leaders to lead efforts to bring new economic opportunities to the community. There’s too much competition between municipalities to sit back and hope the phone rings. We need to stay active as members of the Association of Municipalities of Ontario (AMO) and speak with one voice as municipalities are being asked to take on more responsibilities from downloading, without sustainable funding. The old cliché still applies: there’s only one taxpayer. How do you envision communicating with constituents? For the past 28 years, communicating with the public has been my service. Its been my living. In person, social media interactions, every conceivable communication tool is at our disposal. 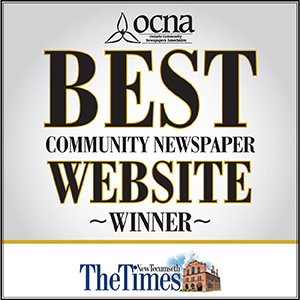 I’m in the perfect position to broaden how we reach our residents because its been my life since entering the New Tecumseth journalism realm in 1990. What will you do to continue to be involved with the community should you not win? I’m focused only on winning so any thoughts to what would happen beyond that, isn’t on my mind. I’ll be happy to answer it on Oct. 23, 2018.